THE NEW IPAD TV AD ! A5X processor: This chip runs four times faster than NVIDIA's Tegra 3 which is great news for gaming and processor-intensive apps like iMovie. iSight Camera: The third-generation iPad includes a 5 megapixel rear-facing camera that utilizes the same optics system that debuted in the iPhone 4S. The front-facing camera remains an unimpressive 0.3 megapixel camera capable of VGA quality images. 1080p video recording: Full HD video recording has come to the iPad, with video stabilization and noise reduction. No more 720p for you. 4G LTE: 4G LTE will be available in the US from both AT&T and Verizon. Coverage may vary. Apple's software now supports hotspots that can accommodate up to five other devices, provided the user's cellular plan does too. Voice Dictation: It's not quite Siri, but it will recognize English, French, German, and Japanese. 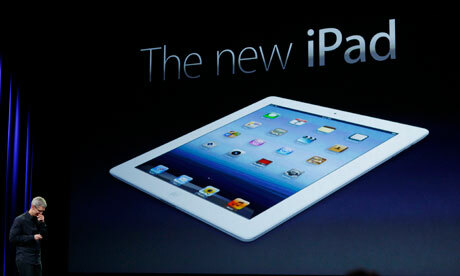 Apple's new iPad will be thicker and heavier than the iPad 2 because it features a bigger, more powerful battery. The new iPad will be 9.4 millimeters thick, or 0.37 inches. That compares with 8.8 millimeters, or 0.34 inches, for the iPad 2. The weight of the Wi-Fi-only model is going up from 1.33 pounds to 1.44 pounds. Models equipped with modems for cellular data access are slightly heavier. The weight places the new iPad in between the original iPad and the iPad 2. However, the new iPad is still significantly slimmer than the first iPad, which was half an inch thick. Even with a bigger battery, the battery life of the device stays the same: about 10 hours. That's because Apple has quadrupled the screen resolution, which in turn requires more computing power. The battery capacity of the new iPad is 70 per cent higher than for the iPad 2. Price Range for Wi-Fi iPad: 16 GB ($499), 32 GB ($599), 64 GB ($699).There is no 128 GB option. All the iPad 2s will be available for $100 less. The New iPad will be available on March 16 in the United States, Australia, Canada, France, Germany, Hong Kong, Japan, Puerto Rico, Singapore, Switzerland, UK and the US Virgin Islands. 15.4 million iPads were sold in the last quarter – more than any PC manufacturer worldwide. There are 200,000 iPad apps in the App Store. iPads, iPhones and iPods made up 76 per cent of Apple’s revenue in the fourth quarter of 2011. They sold 172 million of the devices last year. The App store saw its 25 billionth download today, and iCloud has 100 million users. The iPad 2 is 3.5 times more likely to break due to accidental damage than the original iPad. 9.8% of iPad 2 owners reported accidental damage to their tablet in the first year compared with 2.8% of iPad 1 owners. Of the iPad 2 owners surveyed, 72% had some kind of cover on the tablet when they broke it, and 33% of those used a Smart Cover. Simply dropping it during use is most common, accounting for 54% of broken iPads. After that, it’s falling off a table, at 15%. Car-related incidents are next, comprising 11% of cases, followed by misuse by a child, at 8%. Pet owners should feel a bit safer, as pets only accounted for 1% of the broken iPads. iPad 2′s glass is exposed slightly above the bevel. On the first iPad, the aluminum frame protected it better. The curved edge of the iPad 2 makes an impact much more likely to damage the screen. The iPad 1 had a mainly flat edge. The survey states that Apple’s Smart Cover, which it introduced with the iPad 2, “may be contributing to breakage rates” instead of preventing them. Some owners have even tried to “grab” the Smart Cover on a falling device, which can make the situation worse since the cover attaches magnetically, and isn’t intended as a fall protector.